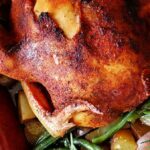 Almost five years ago I posted a recipe for Sticky Crockpot Chicken. While I love my slow cooker, it produces an entirely different texture than you get from sticky chicken roasting in the oven. I love both but wanted to try this rub and recipe slow roasted instead. I’ve made it three times since and it’s been a smash hit every time! This sticky chicken is one of those “Sunday Supper” type recipes, as it does require basting. 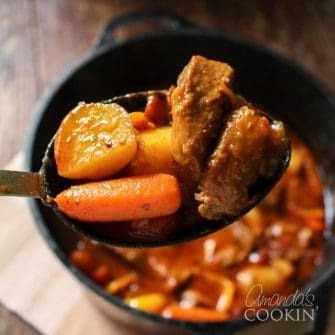 So you can’t really leave the house and toodle around like you can with a slow cooker. It’s a meal that smells positively amazing when you walk in the door. Go ahead, open your windows and tease the neighbors with your sticky chicken aroma. Watch out though, you could end up needing extra place settings! This is my favorite way to roast a whole chicken. 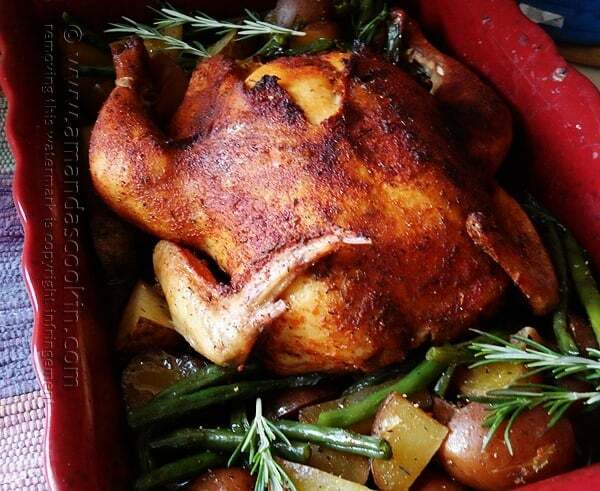 It’s an extremely budget conscious meal when whole chickens go on sale for 99 cents per pound! Remember to save the extra meat for sandwiches, enchiladas or soup, and simmer the carcass with some onion and celery tops to make stock. Start off by preheating your oven to 300 F. Remove any giblets from chicken; clean the cavity well and pat dry with paper towels. Combine all rub ingredients and spread the spice mixture all over the chicken and under the breast skin. Stuff cavity with onions and place chicken into a roasting pan. Bake chicken uncovered for one hour, undisturbed. Add potatoes to the roasting pan, scattering them around the chicken. Drizzle with olive oil. Bake another 40 minutes. Add chicken broth and baste chicken and potatoes. Bake another 30 minutes. Prepare the green beans by snipping the ends and placing in a microwave bowl with 2 tablespoons of water. Microwave on high for 5 minutes. 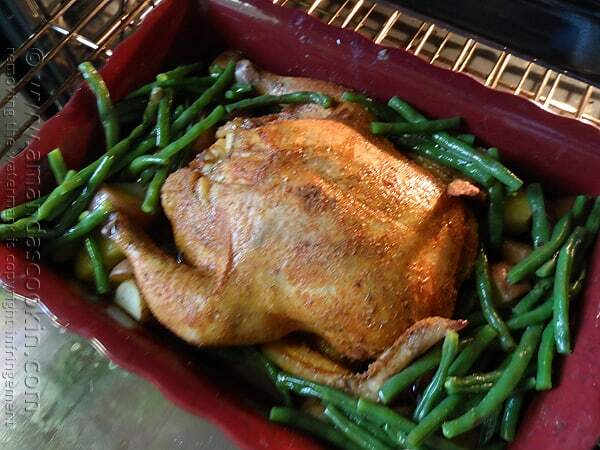 Drain green beans and add to the roasting pan with the potatoes. 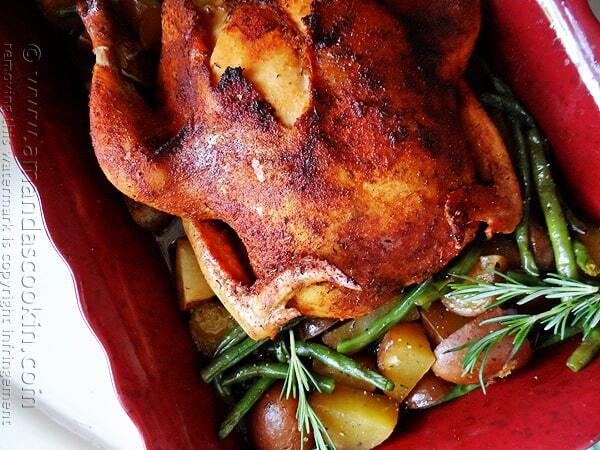 Baste chicken and vegetables. Bake another 30 minutes. Turn oven up to 375 F and bake an additional 20 minutes to brown the edges of the potatoes and beans. Remove from oven and tent with foil. Let rest for 5-7 minutes before carving. I hope you enjoy this Sticky Chicken and roasted vegetables as much as my family and I did! Looking for more chicken dinner ideas? Check out Chicken or Turkey Pot Pie recipe, where comfort is the goal of the meal! You may also enjoy Easy BBQ Crockpot Chicken, Spring Stir Fry, One Skillet Chicken Broccoli and Rice, or Oven Fried Chicken Breasts. Remove giblets from chicken; clean the cavity well and pat dry with paper towels. 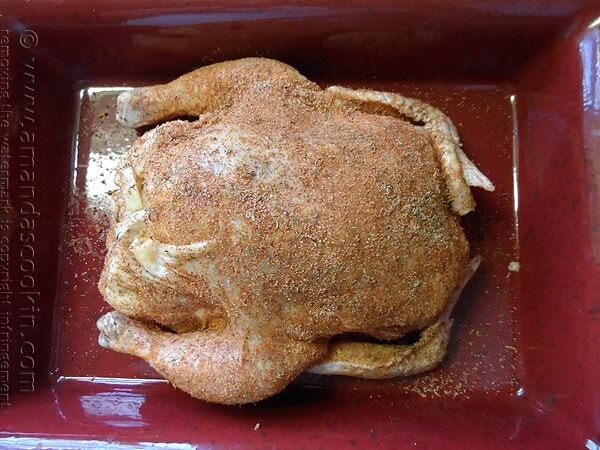 Combine all rub ingredients and spread the spice mixture all over the chicken and under the breast skin. Stuff cavity with onions and place chicken into a roasting pan. Bake chicken for one hour, undisturbed. Add potatoes to the roasting pan, scattering them around the chicken. Drizzle with olive oil. Bake another 40 minutes. Add chicken broth and baste chicken and potatoes. Bake another 30 minutes. Prepare the green beans by snipping the ends and placing in a microwave bowl with 2 tablespoons of water. Microwave on high for 5 minutes. Drain green beans and ddd to the roasting pan with the potatoes. 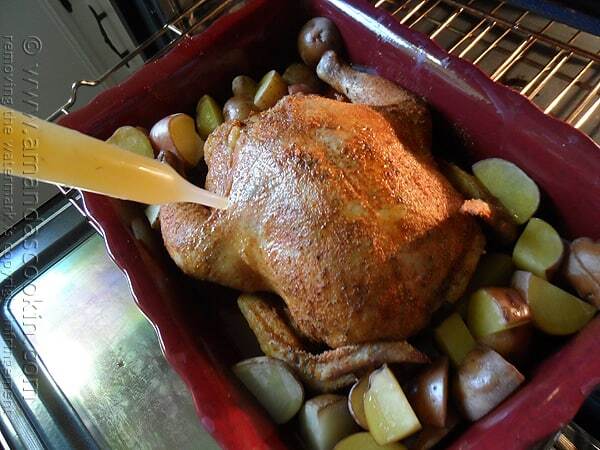 Baste chicken and vegetables. Bake another 30 minutes. Turn oven up to 375 F and bake an additional 20 minutes to brown the edges of the potatoes and beans. Remove from oven and tent with foil. Let rest for 5-7 minutes before carving. 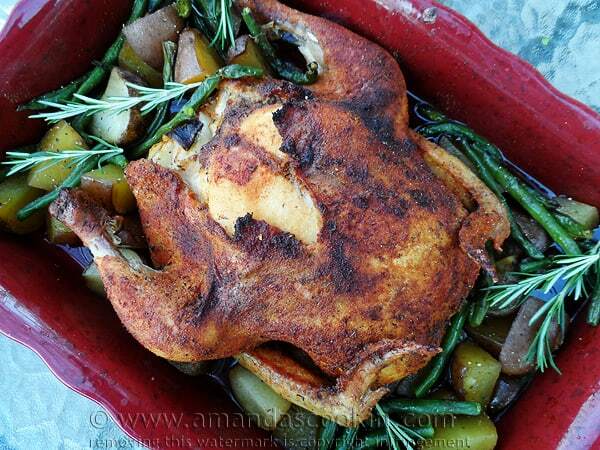 I just love a good roast chicken with veggies. It’s all at once budget friendly, comforting, and satisfying. 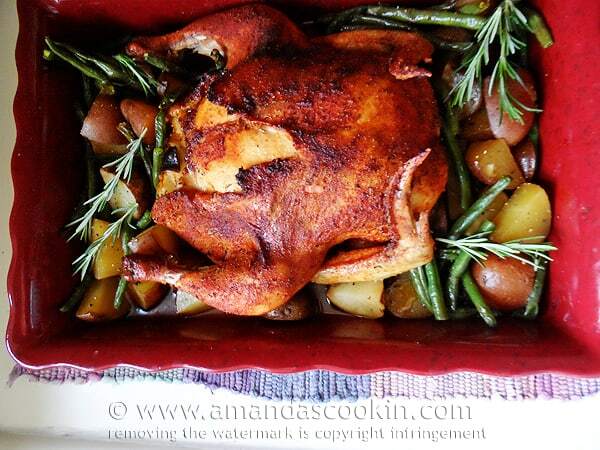 Great spice rub, too, Amanda. Thanks Lana! It’s so juicy and tender, love it! The words sticky and chicken together make my mouth water!! !